Mickey Cohen (Penn) unleashes a firestorm bullets on his opponents. And so it goes in Gangster Squad, Ruben Fleischer’s sleek, shiny, mostly entertaining 1940s-set crime thriller about a group of policemen who go outside the law in their quest to bring down Cohen. The dialogue, hammy and over-the-top as it is, gives the film’s thin plot a much-needed boost and keeps the audience engrossed. The movie looks and sounds like a gritty film noir, with witty one-liners, terrific costuming, and stylish direction. If only everyone involved had committed to making Gangster Squad more than just a fun, goofy shoot-’em-up thriller, which is what, despite its noir trappings, the film ultimately reveals itself as. Though some of the earlier scenes in the movie promise a gritty, stylish crime drama, Gangster Squad quickly succumbs to its desire for high-octane action sequences. The camera slows down to capture each bullet flying during the many shootouts, and by the time the film’s finale rolls around, the movie has given up any pretense of refinement, settling instead for an exhilarating, pulpy gun battle complete with slo-mo exploding ornaments and enough blood to satisfy the Red Cross. That’s not a bad thing. Though Gangster Squad misses out on the opportunity for film noir intrigue, it’s ultimately a rollicking good action thriller that makes the most of its visually-splendid setting. In my book, that’s above and beyond what most crime flicks bring to the table. 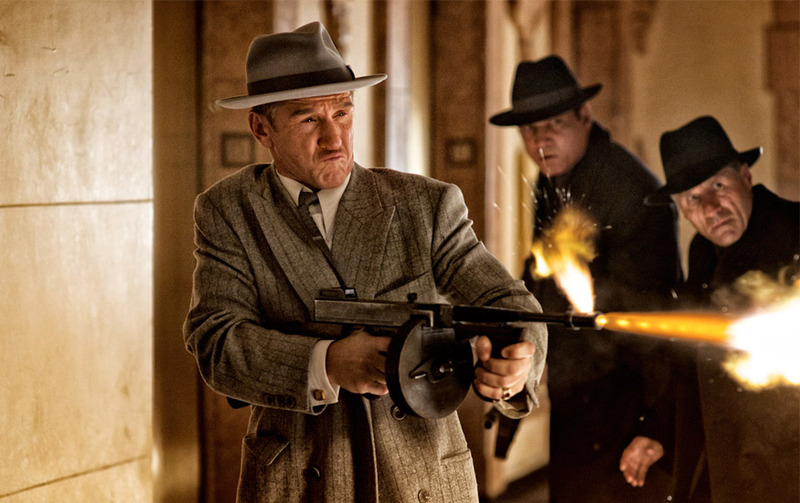 The movie’s first-rate cast helps Gangster Squad go down a lot smoother. Ryan Gosling does his best to give cool-as-a-cucumber Sergeant Jerry Wooters some depth, while Josh Brolin is gruff yet effectual as square-jawed, straight-shooting squad leader John O’Mara. Sean Penn, buried under hours of makeup, gives the best performance of the bunch as coldly ruthless, gleefully homicidal mob boss Mickey Cohen, an East Coast thug who has worked his way up the ladder of power using only his fists and quick trigger-finger. The rest of the Gangster Squad are all under-utlized, including Gionvanni Ribisi, Anthony Mackie, Michael Peña, and Robert Patrick, but they play their parts well. The requisite eye-candy appears in the form of Emma Stone and Mireille Enos, two women with little to do other than support their men but who still manage to wring some gravitas out of their few lines. And watching Nick Nolte (Chief Bill Parker) and Brolin, two birds of a feather in terms of surly delivery, is a strangely hilarious and absorbing optical illusion. This entry was posted in Reviews and tagged 2013, crime, dvd, emma stone, gangster squad, josh brolin, review, ryan gosling, sean penn. Bookmark the permalink.